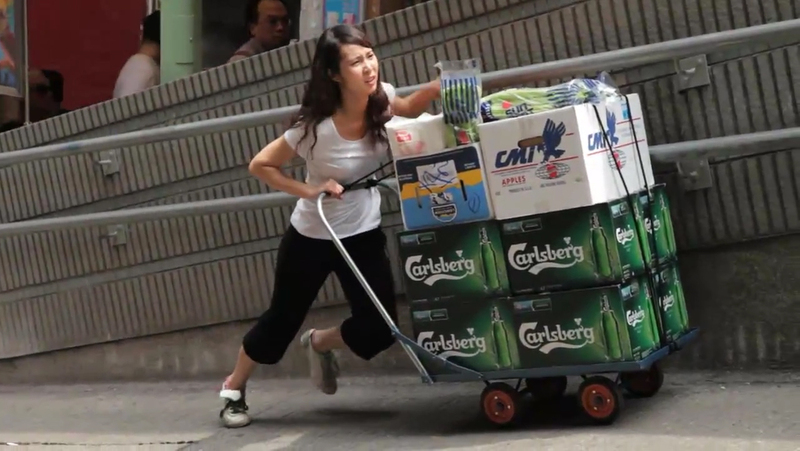 Carlsberg beer is being promoted in Hong Kong with an advertising campaign celebrating people who stand up and do the right thing. Nine different cameras were used to capture the response of the public to four scenarios: a woman pushing a barrow up a hill, a drunk driver attempting to unlock his car, a group of mean men blocking a bridge to pedestrians, and a waitress unaware of an embarrassing tail. The Social Experiments campaign was developed at JWT Hong Kong by creatives Sly Song and Barbara Fu, and agency producer Catherine Law. Filming was shot by director Thomas Lo, producer Elvis Lo, assistant producer Mo Cheng, director of photography Meteor Cheung, casting agent Terence Li, hair and makeup stylist Kaman Ng, offline editor Thomas Lo at Wow Wow Tank, and sound engineer/music composer Ulf Olofsson. Music is “One Man Army” by Jay Price. Actors include uphill girl Ng Ka Yee, drunk man Yung Ka Wai, waitress Cheung Ho Yee Emily, mean guys Shek Wing Hong, Benny Lo, Ming Lawrence, Lai Wong, Wang Chi, Derek Lam, Ho Chi Hang Allen, Tang Chan, and Sze Hoi.